And it’s particularly bad news for farmers. What happened? Just after taking office that winter, Georgia Gov. Nathan Deal signed a bill that, he vowed, would “crack down on the influx of illegal immigrants into our state.” Known in civil-liberties circles as Georgia’s racial-profiling law, House Bill 87 encouraged local police officers to check the immigration status of anyone suspected of violating any regulation, including traffic rules, and imposed harsh penalties on anyone caught “harboring an illegal alien.” The governor probably didn’t intend for his signature immigration law to cost his state’s farm sector loads of cash. But his timing couldn’t have been worse. A shortfall of 11,000 workers—representing about 85 percent of peak employment—caused $75 million in crop losses that spring alone, with a total hit to the state economy of $103.6 million that season, according to a study by the University of Georgia. Neighboring Alabama passed an even more draconian law later that year, spurring its immigrant farmworkers to exit en masse and costing the state up to 6 percent of its gross domestic product. The US harvest requires between 1.5 million and 2.2 million workers annually—and at least half of them are undocumented. Now, the entire country is governed by a chief executive who vows to make life miserable for undocumented immigrants. Pursuing what might be called his “bad hombre” theory, President Donald Trump swiftly made good on promises to ramp up deportations after taking office. Just as in Georgia, the rest of the nation’s farms lean heavily on the very group of people targeted by the president. According to the American Farm Bureau Federation, the US harvest requires between 1.5 million and 2.2 million workers annually—and at least half of them are undocumented. For years, the agriculture sector has grappled with farmworkers’ immigration statuses—but there are no easy fixes. After Georgia’s crackdown, Hall says, the state’s large growers eventually responded to the labor shortage by leaning on the H-2A immigration guest worker program, which gives migrants temporary visas without a path to citizenship. Indeed, the Trump family’s own Virginia vineyard applied to the US Department of Labor for six H-2A visas in December, weeks before his inauguration. But Hall says the H-2A program has failed to keep up with Georgia’s labor demand—and as recently as the spring of 2016, large-scale Georgia farmers were again complaining of six-digit losses as crops rotted and requests for H-2A workers went unanswered. 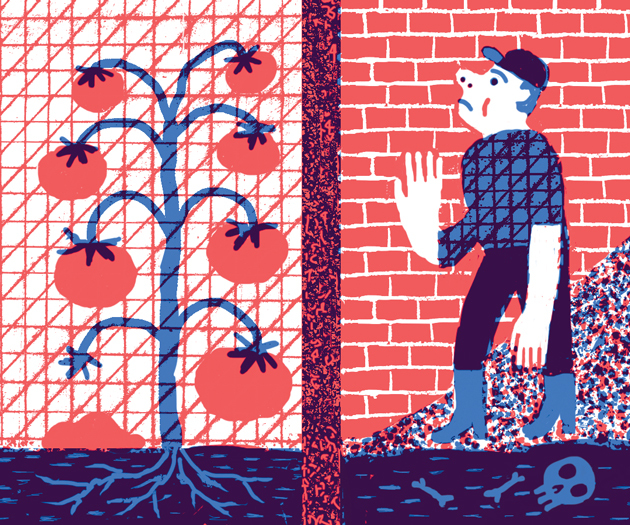 If farmers and farmworkers face a tough row to hoe, what about eaters? Most US consumers likely didn’t miss the blueberries or bell peppers that rotted in Georgia’s fields—they could opt for those grown in California or Mexico instead. But Trump appears to want to take the spirit of the state’s immigration policy nationwide. Federal immigration policy Trump is promoting could result in a massive farm labor shortage across the country, causing domestic fruit output to plunge anywhere from 30 to 61 percent. Research by the Farm Bureau suggests that the federal immigration policy Trump is promoting could result in a massive farm labor shortage across the country, causing domestic fruit output to plunge anywhere from 30 to 61 percent and vegetable production to fall by 15 to 31 percent. Industrial-scale livestock operations and slaughterhouses also rely heavily on immigrants, so meat production could tumble by as much as 27 percent. As a result, the group concludes, US eaters are looking at food price hikes of 5 to 6 percent. That might not sound like much, but it’s sure to squeeze families on a tight budget. So Trump’s efforts to save us from “bad hombres” is bad news for farms—and for Americans who are just trying to put dinner on the table.